The worldwide mobile industry should bring in $1.3 trillion in 2011 and will represent about 2 percent of global gross domestic product, according to data released today by analyst Chetan Sharma. In his review of the first half of 2011 he estimates that carriers will see about $300 billion in mobile data revenue and highlights the biggest concerns carriers face. I’ve outlined them with corresponding charts below, but be sure to read his full analysis here (or embedded below). Revenue is falling on a per minute, per text and per megabyte basis. Overall revenue is on the rise for mobile data, but in general the price for voice minutes and everything else is on the decline. Meanwhile demand for data is rising by four to six times per year as more people get smart phones and add more mobile devices such as tablets. So we’re buying more but at lower prices per unit. Even as the price of data drops, demand rises and carriers need to watch their bottom lines. 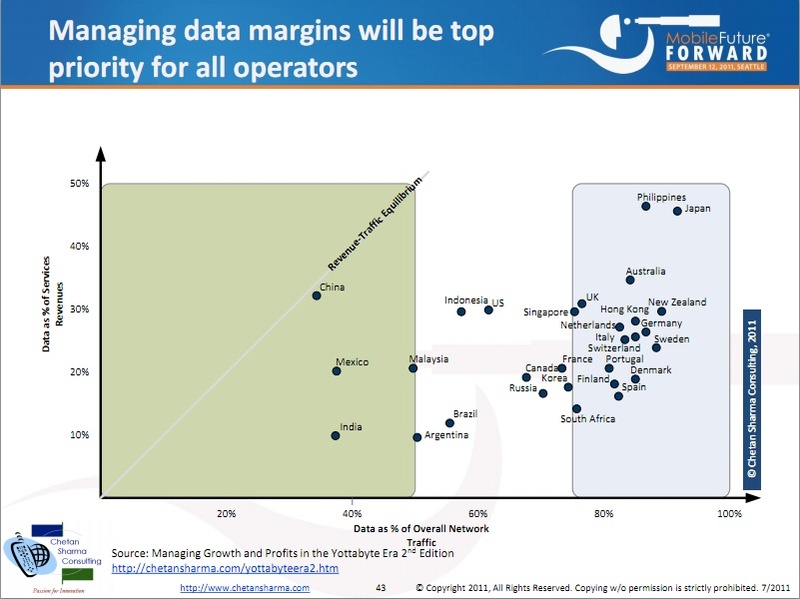 Thanks to Sharma, I wrote about this back in 2009, but carriers are still grappling with how they can provide the services people want, at price plans that protect their margins and also ensure customers use their brand-new data networks. 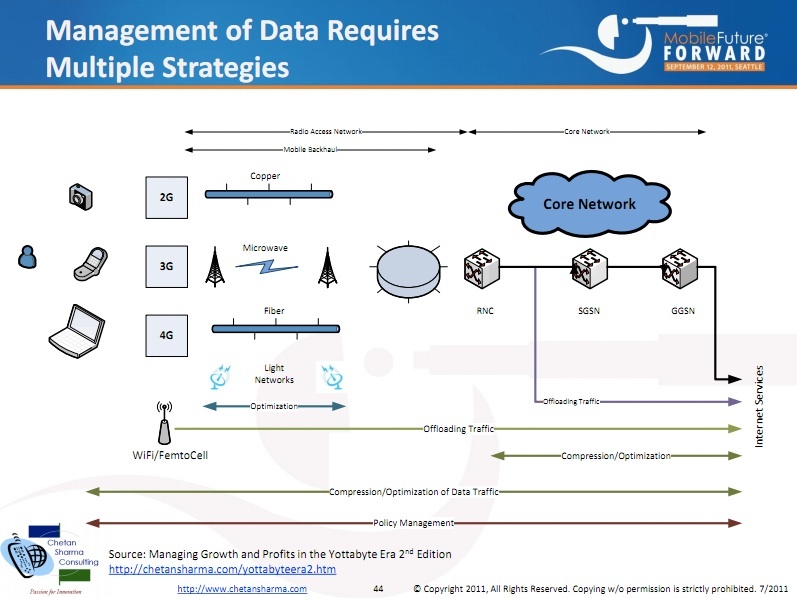 Carriers must take a holistic approach to maintain margins. Given that the demand for data isn’t subsiding, carriers have to lower their costs of providing it. Sharma estimates that it costs a U.S. operators $10 to $12 to deliver a gigabyte of data, which is in line with the current plans and overage fees currently available. 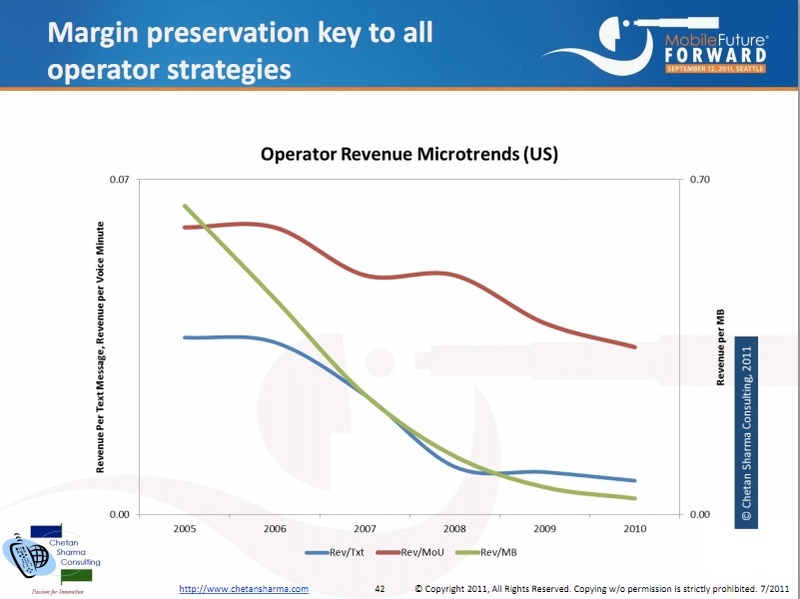 But, if operators lower those costs they can improve their margins. Some steps could include integrating Wi-Fi into the network to reduce the cost of a gigabyte or boosting margins by changing the pricing plans. Interesting data – could we get a legend on slide 6 for the Global market snapshot though? Without it, it makes no sense. Sitecats Mobile Apps, Inc. coming your way! I wrote something about this in 2007 and feel like things have changed and remain the same – Converged Networks, Value Chain Dynamics and the Value enhancement dilemma -1..http://bit.ly/nWrAku. Umm, isn’t “global gross *domestic* product” an oxymoron? That would rank Mobile industry GDP higher than the GDP of Los Angeles (3rd in the World at $792B) and Chicago (4th at $574B), but lower than Tokyo (1st at $1479B) and New York City (2nd at $1406B).